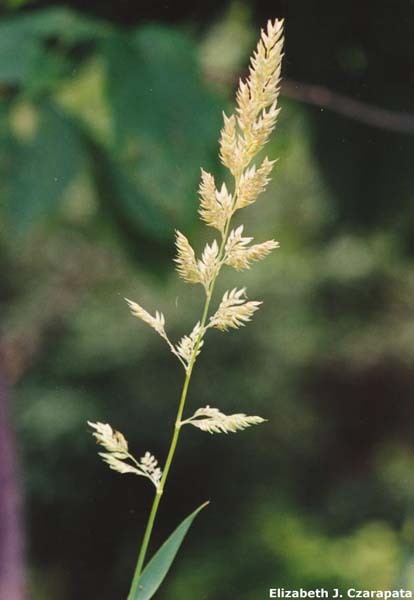 Reed canary grass is a perennial, sod-forming, cool-season grass. It has hairless stems that can grow to 6' tall. There is evidence that there are some native strains but its thought that the invasive strains are not native. Leaves: Leaves are flat with rough texture on both top and bottom. Flowers: 3-6" green to purple flower heads will bloom May through July. Once seeds form the flower turns to a tan color. Fruits & Seeds: Seeds ripen in late June and germinate immediately. Seeds are spread by water, wind, animals, and human activity. Roots: Rhizomes with many buds create a thick mat at, or just below the surface. 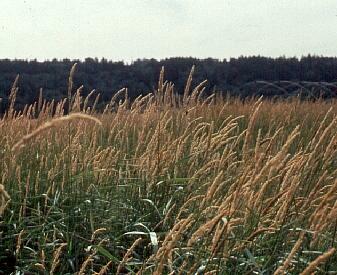 Reed canary grass dominates many wetland across the Midwest. It can also spread into forests, prairies, fields, and floodplains. It has dense monospecific stands which out-compete desirable vegetation and are of little use to wildlife.